Ever since we started TREK, I have been sparing my mom of the details, knowing how much of a worrier she is. All those years, my mom was my quiet supporter. She would always be worried about the possible dangers of our expeditions and was very vocal about it, yet, she would always be asking what else the kids need that she could possibly give or ask from her friends. Our lone outreach this year was in celebration of our 9th year. I thought that would be something she could do, so I invited her. I also felt it was high time for her to experience TREK, which has been taking me to away from home during my birthdays since we started. She immediately said yes. Throughout the preparation, she was very excited. She even bought a new footwear and joined us in our Zumba Fundraiser sponsored by Gold's Gym to prepare for it. The outreach was in support of the Tau-buid Tribe, one of the eight group Mangyan ethnic groups of Mindoro. Months ago, with some public school teachers from Calintaan, we trekked the hills of Mt. Malpalon to conduct a recon at two of the schools of the Tau-buids - Balangabong Elementary School and its annex located in Sitio Olango. Malpalon is just beside Poypoy, the jump off to Mts. Iglit and Baco, which is on every Filipino mountaineers’ bucket list. We were lucky it didn't rain the previous nights, so the pickup truck we used was able to take us as far as the second river we had to cross. From the river, it was a 30-minute ascent to the community. The annex school is farther but is a more relaxing trek. Nothing strenuous, just a few river crossings. During the recon, Balangabong Elementary School and annex Teacher in Charge Brian M. Angagan briefed us on the daily travails of the students and explained to us the needs of the students. Most of his requests for the students were very simple, but we knew they needed more than what Teacher Brian asked from us. We saw a dilapidated blackboard, non-functioning comfort rooms, and the lack of clean water. The condition of the annex school was more disheartening. 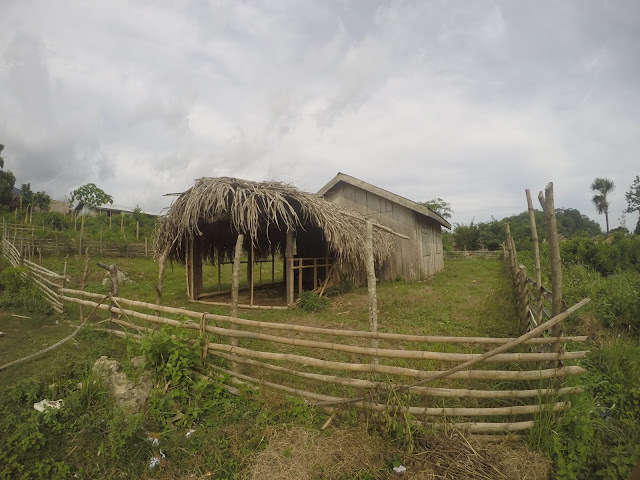 The two classrooms were just makeshift, with one classroom having just palm fronds roof. We couldn’t imagine how they can hold classes when it is raining. But, we were very encouraged. Despite this, students still pursue, and we want to help. Well, it rained, so it was not that easy as I expected. It was August so we expected the rain, but not that much. The day before our scheduled departure, we were already contemplating on postponing the project. But, everything was ready so we just decided to push through with it. We made some adjustments, though. We decided not to visit anymore Olango and just leave the donations at the barangay hall. I also decided that we would let the rest of the group go ahead of us and we would sleep one night at a resort so my mom would have comfortable sleep. She needed to rest after a ten-hour overnight bus trip. The following day, the weather was much better, but the trail condition was still not good. We had to walk an extra kilometer because our truck could only take us as far as the barangay hall, which would still require an hour walk to the jump-off point. It was an easy and relaxing walk, though, except for a few paddles that got us muddied. Throughout our two-hour trek, she didn't complain. I think she was even giddy when we crossed the river. During our ascent, I was the one who would remind her to call for rest stops. It was such a Herculean effort to pull our feet out of the mud, and because we were both afraid to slip, we moved so gingerly. When we reached the school, the program already started. We were both tired and we just watched the volunteers and the kids play and dance. 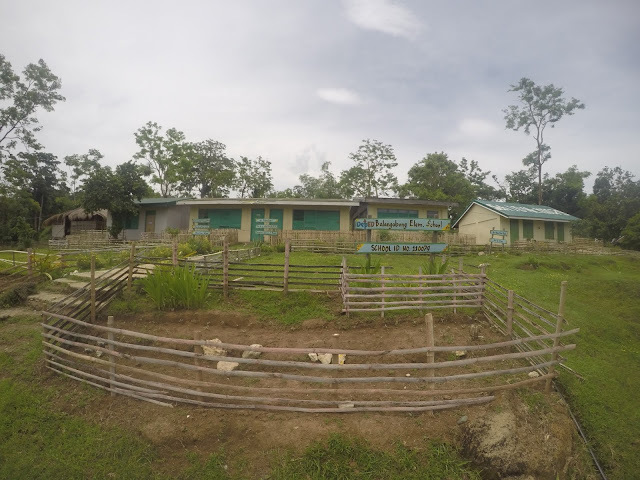 After resting a bit, I walked around the school to look at the hand washing area we had constructed, the water system and comfort rooms we had repaired, and the new blackboards. I had seen the school months before. It was very quiet as opposed to what I was seeing. There were activities in every corner, all filled with bursts of laughter and cheers. I noticed the word fadi-fadi written all over the board. It sounded like "Party! Party!”, which we all liked exclaiming. It meant thank you. I found the word so endearing and sincere. And, then I noticed, everyone, including volunteers, kept shouting fadi-fadi. And there were a lot we were thankful for. Fadi-fadi first to the donors and volunteers who made the outreach possible. Fadi-fadi to the volunteers and some members of the community who prepared our meals for us. Fadi-fadi to the kids who prepared a program for us. I saw my mom shed a tear when the kids sang "Doon sa Kabundukan,” a song that talked about the discrimination the tribe face. "Kaming mga Mangyan ay tao. Kami’s hinahamak, ginagawan laruan.” (We, Mangyans are people. We are being discriminated and toyed at.”) And then again, when the kids sang their thank you song. Most of all, fadi-fadi for the good weather for the rest of the day. The trails dried up already when we went down, which made trekking much easier. Good friendships are built throughout our nine years of doing these outreach projects, and every time, we welcome new friends. So, whenever possible, we set aside a day for side trips, which adds to our bonding activities. These moments are filled with a recounting of experiences. We briefly stopped at beautiful waterfalls that the barangay officials were raving about and they had every right. We also stayed at Labros Resort and Adventure Park, which had beautiful rooms and a wide cream-colored fine sand beach. We also dropped by the Local Government Office, where we were welcomed by the Mayor, the Vice Mayor, and other officials. Up to the bus on our way back home, the socials continued. Actually, it was even up to facebook. I get notifications every now and then volunteers who continue sharing their stories. I also posted my mom's pictures on that same social networking site and it got a lot of likes and a congratulatory message. She was happy with all the well wishes. Most likely, TREK Calintaan was not her first and last.